Start by spreading out your lumber. Mark out each part with chalk. If your quartersawn wood is rough (and most comes this way), you’ll need to take a light pass with a thickness planer or hand plane to get a good sense of the grain on each board. Right now, remove just enough of the surface wood to expose the grain. You’ll do final planing later. As you work, keep your best boards for the tabletop since it will be the most visible part of the project. When laying out the drawer fronts for each level, use the same board, keeping the original left-to-right orientation. Using this technique, the grain will flow continuously from drawer to drawer. Rough-cut all of the stock a couple of inches longer than listed. Note that the lengths in the materials list include tenons where they’re needed. Further prepare your stock by jointing and planing it; use the same machine settings for all components to ensure consistent thickness. Mill some extra pieces in scrap stock for each part so you have wood to use for critical machine set-ups later. I made each leg from three pieces of wood to get the required thickness without paying for extra-thick lumber. Shop-cut quartersawn veneer glued on afterward hides the lamination lines. Using veneer also lets you show the gorgeous ray fleck grain pattern on all four sides of each leg. Prepare your leg stock to the listed thickness, then glue the leg pieces together. Make them a little more than the finished width. It’s also a good idea to leave the blanks a little long. With all four legs in hand, use a planer on the exact same settings for each to bring them to the thickness listed. Glue on 1/8″-thick shop-cut veneer strips last. I made these a little wider than the final dimensions, just in case something shifts a little while tightening the clamps. Be sure to use cauls under the clamp heads to spread the pressure evenly. When the legs are dry, trim and plane them to size. Trim one end of your legs square, then cut them all to length using a compound mitre saw equipped with a stop block. 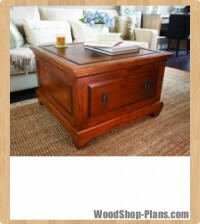 All of the panels that make up the coffee table are 1/4″ thick, but, like me, you may not have wide enough stock. The good news in this case is you can create something called bookmatched grain pattern. This means that the wood grain fans out in a mirror image from the central glue line. It’s a classic Mission detail that is often overlooked in modern woodwork. Saw your boards to a rough thickness of 3/8″, marking bookmatched pairs with chalk so you can reunite them later. Joint the mating edges of the panels without gaps, then glue your panels. They should be at least 1/2″ longer and wider than the final dimensions at this stage. When your panels are dry, plane them down to 1/4″ thick. Next, joint one edge of each panel. This will be your reference edge. Now is the time to trim the panels to final width and length with a tablesaw. The measurements found in the materials list will create a perfect fit. However, due to seasonal movement of the wood, you’ll want to remove a further 1/16″ off each edge. This frame-and-panel design en­ables the panels to float inside the frames without fasteners. By removing the extra amount, the wood in the panels can expand and contract with changes in humidity-a key strategy for preventing panel cracks. Joint and trim all back rails, back stiles and the kickplate to final length and width. Use a 1/4″-wide dado blade in your tablesaw to cut 3/8″-deep panel grooves in the rails and stiles. The stiles require a groove on both sides. Here’s a tip: if you make a pass from each side that adds up to 1/4″ in total, all the grooves will be perfectly centred. Complete grooving operations on all back rails and stiles at the same time with the same machine set-up. This ensures consistency, which is key to a flawless assembly later. 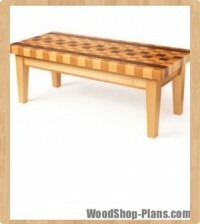 In addition to supporting the coffee table, the legs act as stiles with grooves, supporting the side rail tenons. The only thing is, these grooves mustn’t extend the entire length of the leg. That’s why you need to use a table-mounted router to cut them, not a dado blade. You’ll find that a 1/4″-diameter spiral bit does the nicest job here. Set up a fence with a clamped stop block to limit leg groove length. Before you start routing your legs, mark which one goes where. The grooving operation creates left- and right-hand legs, so be careful. Take several passes for each groove until you get to the full 3/8″ depth. White oak is dense wood and you don’t want to overload your equipment. You have several tenons to cut, and there’s more than one way to make them. My favourite approach uses a dado blade in a tablesaw. Adjust the blade to the correct height for the sides of the stiles (the cheeks), then bring your fence into position with a short stop block clamped to the fence. Locate the block so the end of your workpiece moves past it as the mitre gauge slides forward. The stop regulates the location of the tenon cuts, but the wood must slide past it before contacting the blade. This procedure minimizes the risk of blade binding and kickback. Cut a tenon on a piece of scrap to confirm that you have the blade set to the right height.Your goal is 1/4″-thick tenons that are 1” long. Once you’ve cut the sides of all rails and the kickplate, raise the blade up to 3/8″ above the table and cut the bottom shoulders on all of them. Do the same thing on the top shoulders of the lower rails and kickplates, but leave the tops of the top rails alone for now. The top rails feature what are called haunched tenons. Haunching extends the full width of the tenon for the first part of the tenon, with a more typical, narrower profile further along. This feature takes more time to build, but it creates extra strength where the mortise nears the top end of the leg. Mark your tenon 3/8″ in from the shoulder and 3/8″ down from the top. Cut off this waste with a fine-tooth handsaw. Reset your tablesaw to cut the tenons on the back stiles. Although they’re 1/4″ thick like all the others, they’re only 3/8″ long to allow them to sit in the rail grooves alongside the panels. Next, mark your mortise locations, and cut them according to the size of the mating tenon. The mortises all sit in the panel grooves you cut previously in the legs. All you need to do is deepen the grooves in the correct locations. The plans show more details. The kickplate calls for mortises too. Grab some of the extra leg stock you milled to use as a test piece for your machine set-up. I removed as much waste as possible within the mortises using a 1/4″-diameter Forstner bit in a drillpress, followed by some chisel work to clean up the holes and square up the ends. Aim for mortises that are 1/16″ deeper than your tenon length, providing room for excess glue during assembly. As you drill out the mortises, the bit will get hot. Drill one or two, then let the bit cool. While that’s happening, do your cleanup work with a mallet and chisels. By the time the mortises are squared, the Forstner bit will be cool again. As you drill and fit the various mortises, mark each leg and its companion mortise to spare you the guesswork of what goes where during glue-up. Before the first stage of assembly, you need to saw grooves in the two top side rails to accept the tabletop clamps. Using your tablesaw, cut the groove according to the clamps you will be using. Once you’re satisfied that everything fits, sand all the parts you’ve worked on so far. It’s easier now be­cause you don’t have troublesome corners and cross-grain connections to contend with yet. Sand all components up through 120- to 220-grit. Any exposed corners should be very slightly rounded with handheld sandpaper. File and sand small chamfers onto the bottoms of the legs to prevent splintering if the table is ever dragged across the floor. Begin assembly with the sides. In­sert the rail tenons in one leg, slide the panel in place and cap it with the other leg. While the tenons and mortise surfaces must be coated with glue, the panels must be kept dry so they float. Clamp up this assembly, then check it carefully for square. With both sides complete, join them together with the back lower rail and front kickplate. The back is essentially the same as the sides; it just has more panels and intermediate stiles. Bring the parts together in the same way. As you work, you’ll find it helpful to attach a temporary support rail at the front top. Clamp a piece of scrap to the front legs so they’re 36 1/2″ apart. 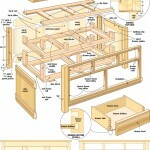 Check for square across the entire piece to ensure the drawer frame can drop into place easily. Web frames are horizontal assemblies that support the drawers. You need to make three: one to support the lower drawers, one to support the upper drawers and one to stop the upper drawers from tipping when pulled out. The web frames are separated by uprights, which are the same height as the drawers. Start by drilling and counterboring holes for #8 x 2″ screws for attaching the web frames to the legs. Also, before web frame assembly, cut saw grooves in the perimeter of all upper frame components to accept metal tabletop clamps you’ll install later. I assembled my web frames using #20 biscuits for all joints, except the top frame, which is attached to the short uprights using screws for strength; this is be­cause when you lift the coffee table, you would normally lift it by holding the top. The tips of the biscuits extend be­yond the frame edges, but you can remove them using a stationary disc sander. Assemble each frame, taking the time to ensure everything is square. Smooth the joints with a belt sander, then join the completed frames with the uprights using one or two #8 x 2″ screws driven into each upright. Cut, glue and clamp the 7/8″ x 1/2″ drawer guides onto the top surfaces of the bottom and middle web frames, right behind the front uprights. With all three web frames together, drop the assembly into place between the legs. To make this easier, I glued six blocks to the lower part of the carcass: three on the inside of the kickplate, 7/8″ down from its top edge, and three on the lower back rail at the same height. Now is the time to use glue to fasten the upper rear rail of the web frame cage to the inside face of the top rail of your cabinet. Drill pilot holes and install eight #8 x 2″ screws, attaching the web frame to the legs through the uprights. This reinforces the kickplate. 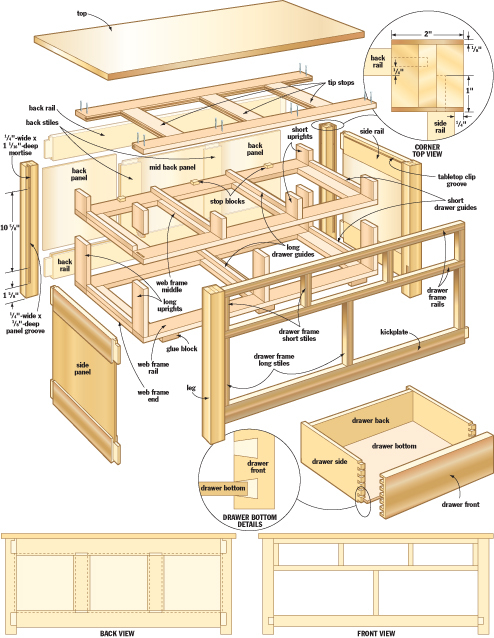 Attach your quartersawn drawer frames to the front face of the web framing. You won’t need this on the bottom frame, since the kickplate serves the same purpose. As with any workshop project, the actual sizes of the drawer openings will vary. That’s why it’s best to build each drawer to fit each drawer opening. Naturally, all drawer fronts are quartersawn white oak, but I chose 1/2″ Baltic birch plywood for the sides and backs, along with 1/4″ Baltic birch plywood on the bottoms. I used half-blind dovetail joints to attach the sides to the fronts, with the backs and bottoms held in dado slots (see plans for details). If you use another joinery method, you’ll probably need to adjust your material sizes to suit. Begin by trimming each drawer front to fit its opening. Aim for 1/32″ to 1/16″ clearance all around. Trim your drawer-box sides to match the height of each front, then cut them to length. Prepare drawer corner joints now. Test-fit your drawer boxes, adjust size as needed, then reassemble them with glue. Clamp your assemblies and confirm everything is square. Once the drawers are dry, test-fit them and adjust as necessary. If a drawer sticks, check not just the drawer itself but the runners and guides. When the drawers slide easily, rub some paste wax on the runners, guides and drawer bottoms. This time when you push them in, be gentle, and they’ll glide with no effort. Mount the drawer pulls now. 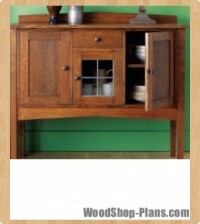 As things stand now, the drawers probably sit about 1/2″ recessed into the frame. Since you really want them to be flush with the frame’s face, you need to push the drawer all the way in, measure the recess depth, then cut stop blocks to match. After testing, glue and clamp the stops to the back web rails, centred in the openings. I built the top last. That’s because it’s a bulky finished piece that’s challenging to store while everything else is in progress. As you plane and joint your wood, make the top at least 1/2″ wider and an inch longer for now. When you orient your boards on the bench, arrange the grain so it’s all running in the same direction. This gives a pleasing visual effect while also making it much easier to plane the tabletop smooth. After trimming, sand the top with 120-, 180- and 220-grit abrasives. Sand the edges as well, going one grit further on the end-grain to close up the pores, keeping it from soaking up more stain and turning out darker than the rest of the top. When the tabletop is ready, turn it upside down with an old blanket between it and your bench to protect that smooth, sanded finish. With the help of a friend, lower the carcass upside down on top of the tabletop, then fine-tune the positioning. I used 20 metal tabletop clamps to secure the top. Put three on each end, one on the front and back near the ends, then spread the rest around evenly. Mark screw holes for the clamps, then remove the carcass. Drill pilot holes for the #10 mounting screws, then reposition the carcass. Be sure to use a drill stop to make sure you don’t drill right through the tabletop as you work. Access to some of the end screws will be tight during the installation, but you should be able to get a hand driver into them. 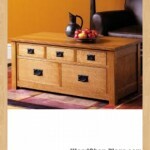 Remove the drawer hardware and sand down the drawer fronts up to 220-grit. Before you complete one final sanding on the rest of the project, check all surfaces for clamp marks or any other blemishes. Repair these areas, then sand the complete project with 220-grit paper. Be sure to use a tack cloth or vacuum to clean off all dust after sanding. Don’t finish inside the drawers or other interior components. Fin­ishing odours take a very long time to dissipate and the smell can even permeate into whatever you store in the drawers in the meantime. 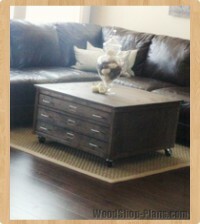 When the finish is dry, reattach the hardware and move your new coffee table to its place of honour. 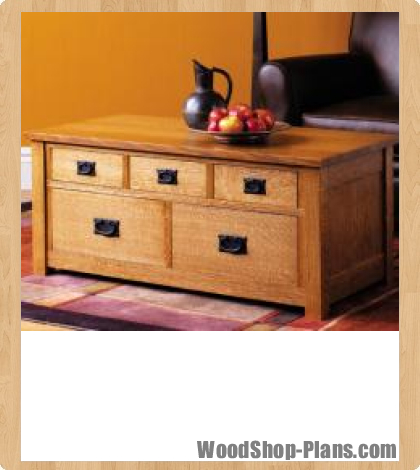 Reserve a drawer for the remotes and TV Guide right away-all the other drawers will fill up soon enough on their own. Powered By SageFox. All Rights Reserved. Designated trademarks and brands are the property of their respective owners.